"What do you make of this, Watson?" 12-inch action figure features interchangeable hands and a host of accessories! Boasts an authentic likeness of actor Martin Freeman. Inspired by the British TV series Sherlock. The good doctor wears his Victorian 3-piece suit, overcoat, and bowler hat. 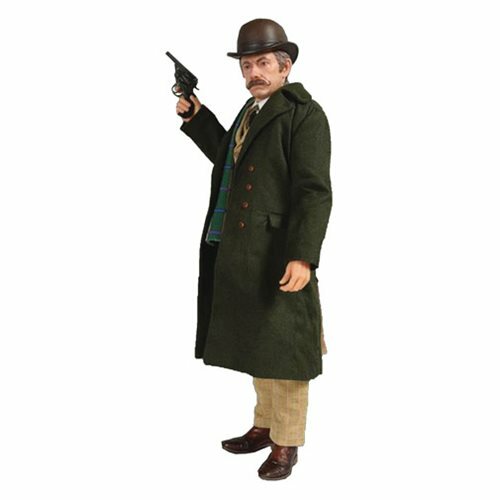 Inspired by the TV series Sherlock, in turn based on Sir Arthur Conan Doyle's detective stories, the Sherlock Holmes Abominable Bride Watson 1:6 Scale Action Figure stands approximately 12-inches tall and features an authentic likeness of actor Martin Freeman. Outfitted in his Victorian 3-piece suit, overcoat, and trusty bowler hat, the good doctor comes with numerous accessories. These include 6 pairs of interchangeable hands; 2 interchangeable gloved hands; a patterned handkerchief, tie, and scarf; a pistol; a Persian slipper; a candle stick with holder; a fob watch on a chain; a display stand; and a dual-signature display plaque. Remarkable! It's through Holmes' Victorian psychoanalytic hallucination that his friend Dr. John Watson is given the role of a published writer, bringing the public dramatic extensions of the pair's adventures and cases. In spite of all his knowledge as a doctor and his skills as a soldier, Watson is struck with fear when he comes face to face with The Abominable Bride. It's only after a few brief encounters with his wife, Mary, that he helps bring the solution into Sherlock's focus and the case is solved… or at least in Sherlock's mind it is.